Jeremy Lin, an American professional basketball player, the first NBA player from Taiwanese descent. Jeremy Lin played basketball with dad and brothers by learning from NBA video when young. He chose to enter Harvard University because of athletic scholarship offer after declined by Stanford University. He helped Harvard to set numerous basketball records of wins. But Lin went undrafted in the 2010 NBA Draft. Golden State Warriors signed two-year deal with him in 2010. Lin also signed a three-year contract with Nike. Lin didn't perform well during his rookie NBA season. He, as a bench player, finished averaging 2.6 points on 38.9 percent shooting in 29 games in 2010. Lin worked to improve his jump shot during NBA offseason. After the 2011 NBA lockout, On December 12, 2011, Warriors waived him to the Houston Rockets. Without playing a season game, the Rockets waived Lin on December 24. That's very sad news to him before Christmas. The New York Knicks claimed Lin off waivers to be a backup guard with a non-guaranteed contract on December 27. He played only a few minutes per game. Then Lin was assigned to play at Development-League. Knicks considered releasing Lin to sign another new player. 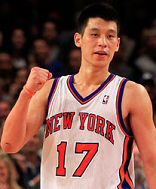 Lin will be out of job, if Knicks released him before February 10, 2012. So Lin slept on his brother's couch in a one-bedroom apartment in Manhattan. On January 20, he won the victory for the team in D-League with 28 points, 11 rebounds, and 12 assists, which brought the attention to Knicks. Knicks had very poor starting record in the 2012 season. Due to the injury problems of players and the absent of powerful forwards, Lin was recalled as a starting guard. On February 4, the first day of the year of the Dragon, Lin had 25 points, five rebounds, and seven assists in the victory over New Jersey Nets. Then he brought six consequent victories over Utah Jazz, Washington Wizards, Los Angeles Lakers, etc. He set a scoring record of 136 points in his five career starts since the NBA-ABA merger of 1976. The Lin-sanity started after the victory over Jazz and now the phenomenon spreads from New York, USA, Asia and the entire sports world. Lin is from a Christian family and has strong faith in God. He and his family discussed issues of the lure of money, women and luxury life in NBA before letting him try the NBA career. He encountered many frustrations in his basketball career. He believes that God always guides him his path. He said his faith in God triggered Lin-sanity. Jeremy Lin’s Cinderella fairy story touches millions of people's heart. His determination, his toughness and his faith encourage people looking for good luck. His intelligence, humbleness and success from underdog win many respects and compliments. The Lin-sanity was estimated to bring hundreds of millions business value. We believe that many people are interested in Jeremy Lin's Chinese astrology. We are happy to interpret this Chinese astrology without his birth time in the following. There are too much Earth and Metal elements in the birth chat. Water is the lucky element, which can release the energy accumulated in Metal. Jeremy Lin was born on the Male Metal Dog day in the Metal Monkey month of the Earth Dragon Year. The upper row of the Day Column is called Day Master (or Day Stem) and represents the person. Therefore, Male Metal represents Lin himself. Dog in Day Column and Dragon in Year Column are in the Earth group and mainly contain Earth. There are four Male Earth in the birth chart. So Earth is strong. Monkey in the Month column is in the Metal group. Lin was born in the autumn and Metal is the strongest element in the fall. There are three Male Metal and one Female Metal in the birth chart. Therefore, Metal is even stronger than Earth. Earth is the Mother element of Metal. Since Metal is very strong, Lin has a good health and he is strong-minded. Dog contains Male Earth, Female Metal, Female Fire. We have Jeremy Lin's 10-God Relationship Chart on the right. Two Male Earth, Guardian Star, appear in the Year Column. Parents had to hire a baby-sitter or relative to take care Lin, when Lin was young. Or Lin has a God-mother. Another sign is that Lin has to leave home town away from parents for living. Wood is weak in Year and Month Columns. Wood is connected to money. Lin's family was probably not very rich when he was born. Wood also represents woman to Lin. The Dog in the Day Column represents his marriage and spouse. Male Earth in the Day Column is the opposite element to Wood. That's another sign of late marriage. His spouse will likely have her own career and won't stay home as a housewife. Earth is related to religion. The Earth is strong in the birth chart. So Lin must have a strong faith in religion. The strong Earth people always keep promise. Since we don't have birth time, we don't know the exact Lucky Element. But according to the Five Element Balance theory, Metal and Earth have too much weights in the birth chart. Therefore, we can say Metal and Earth are unlucky elements. We can assume Water as the Lucky Element, because Water can release the energy of strong Metal. Water is the Child Element of Metal. Water is something out of Metal. Water connected to Lin's outlook, performance, expression, freedom or reputation. The next step is to look at Jeremy Lin's 10-Year Major Cycles. We can roughly see a person's rise and fall during his life from the 10-Year Major Cycles using the Lucky Element. To determine the Lucky Element must to know the birth time. Although we don't have Lin's birth hour, according to his story, we have the following conclusion. Water brings him fame. Wood brings him wealth. Fire is related to his career or pressure. Metal helps him spend money. Earth increases his faith. Water is connected to north. The northern side of birth place makes him famous. Wood is connected to East. The eastern side of a continent makes him rich. Chicken is Metal Chicken contains Female Metal. So this is a very strong Metal Cycle. Metal is related to Lin and his same age siblings and friends. Lin must have many companions playing with him when young. Metal makes him strong. He had unlimited energy with stubborn and naughty personality. Metal is connected to spending money. This implied Lin's parents had to work hard to support family's finance. Dog is Earth Dog is Earth, which is the Mother Element of Metal. So Earth is related to parents, mentors, protection, education, physical or spiritual teachers. Lin had good family, school and church educations. Water is the Child Element of Metal. Water can release Lin's energy. Since Water is the Lucky Element, whatever he performs, it should bring him good reputation. 2010 is Metal Tiger. He joined Golden State Warriors. 2011 in Metal Rabbit. Tiger and Rabbit are in Wood group. He got income. 2012 is Water Dragon Year - a strong Water year. February 4 is the starting day of the Water Dragon Year. The month is Water Tiger. Water came like a flood and made him famous. Pig is Water Pig contains mainly Water. This is a strong Water Major Cycle. Jeremy Lin's popularity will continue in these 10 years. Female Water in the Major Cycle and Male Earth have Attraction Relationship into Fire, which is related to his career. Pig contains also Male Wood. His fame has the chance to build up the wealth. Rat is Water Rat contains Water. Rat and Dragon have Attraction Relationship into Water. Lin's good reputation should continue. Wood represents money. Since Water supports Wood, money luck is pretty good in this 10 years. Cow is Earth Cow contains only little Water. People will be forgetting Jeremy Lin. Female Wood is money. But Female Wood and Male Metal in the birth chart have Attraction Relationship into Metal, which is related to spending money. This implies the money comes and goes. He will spend or donate money to the one he loves. Cow contains mainly Earth, which is connected with religion. He might have stronger and deeper faith in God. 2012 is Male Water Dragon year. Dragon is also called Water Dam. Strong Water washes and cleans Metal to become a diamond. February,2012 Male Water Tiger Water is fame. Tiger is Wood, which is money. Nike has renewed multi-million dollar contract with him. Lin had turned down tens of millions US dollars endorsements from China, because the products don't fit his image. March, 2012 Female Water Rabbit Water is fame. Rabbit is Wood, which is money. Female Water and Male Earth have Attraction Relationship into Fire, which is career. Rabbit and Dragon have relationship to form stronger Wood. April, 2012 Male Wooden Dragon Wood is money, Dragon is Earth. Dragon also contains Wood and Water. Fame and wealth are in there. 2013 is Female Water Snake year. Female Water and Male Earth of Year Column have attraction relationship into Fire. Snake contains Fire and Earth. But Snake and Monkey of Month Column have attraction relationship into Water. Water is fame, which is still strong. Multiple attraction relationships imply very good public social relationship in 2013. Jeremy Lin's story inspires many people in many ages, levels and nations. That's the "If you work hard, you'll achieve great things" American Dream story. If you have a long way to reach the goal of your life, you should learn the spirit of Lin's perseverance, humility and faith to pursuit your dream. As long as you advance to your goal one step at a time, you will get closer to your dream everyday. If your dream hasn't come true yet, then you should keep dreaming for it. No matter it will come true or not, dream will bring you hope and energy for the days to come. Also, dreaming the dream itself is a beauty and joy. You should keep that in your heart forever.